A Wyoming native, Mel Fillerup grew up in Lovell where he learned the work ethics of a farmer as his family worked through the Depression years to provide for one another. He graduated from Lovell High School as WWII began. After being discharged from the military Mel enrolled at the University of Wyoming to study law, and while attending met Ruth McNiven. The two were married in 1948 in Salt Lake City, Utah. 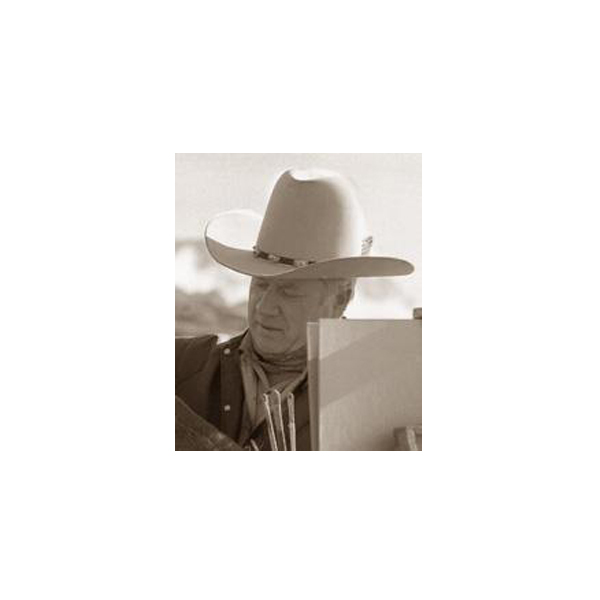 Upon graduating from Law School in 1952, Mel moved his family to Cody, Wyoming to set up a law practice. Mel would practice law for the next 20 years before closing the business to fulfill his dream of painting full-time. Mel was active in his art community as a member of the Cody Country Art League, the American Indian and Cowboy Artists, and the Society of Animal Artists. His work has been featured in Southwest Art Magazine, American Artist Magazine, the Buffalo Bill Art Show, and the Audubon Wildlife Art Show, and was one of the first artists to be represented by the Big Horn Galleries in Cody. Mel received several awards and honors throughout his career. However, it was the William E. Weiss Purchase Award from the Buffalo Bill Art Show in 2005 that he was most proud of. Mel created dynamic landscapes and works that reflected his interest in the wildlife and people of the West. He worked in oil, gouache, and watercolor. His works exemplify the grandeur, beauty, and serenity of the western landscape and the cultural heritage of the Native Americans.